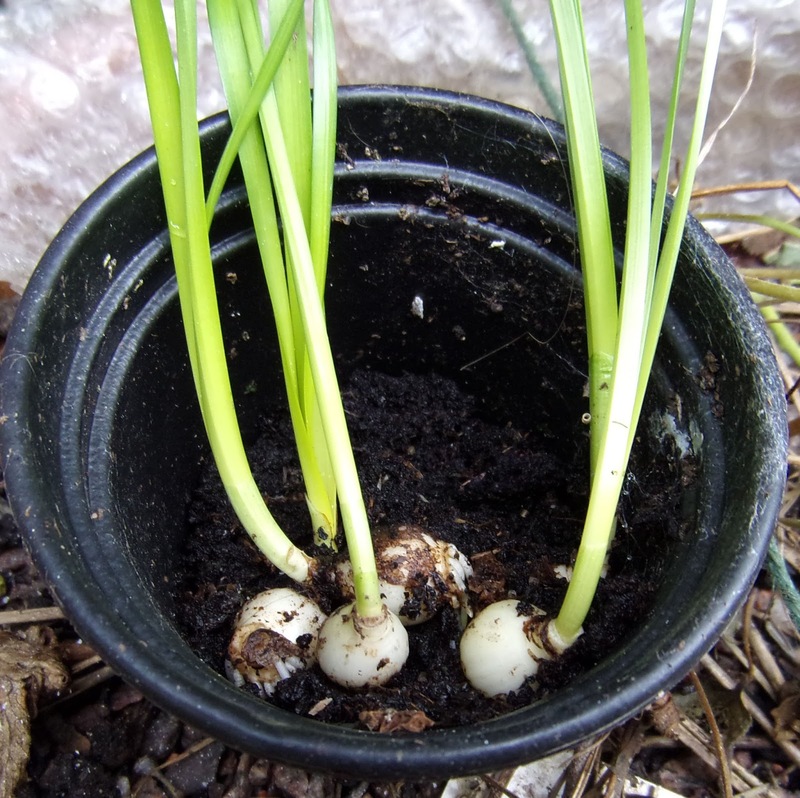 On one of my meanders down the garden, I noticed some bulbs which had obviously fallen out of a pot, lying on the top on a larger pot. There was no name with them, so I am not sure whether they are snowdrops, grape hyacinths, crocuses, scillas, pushkinias, snake's head fritillaries or something else. 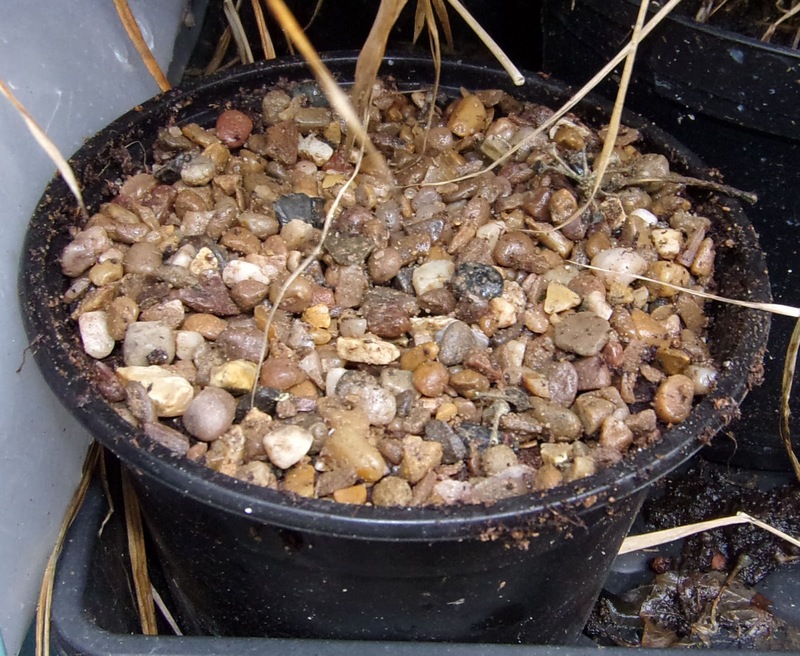 I felt really sorry for them as they were doing their best to grow with no soil. Then I saw these bulbs, half in a pot, again, doing their best to grow. I really am not a very good gardener when I let this happen! 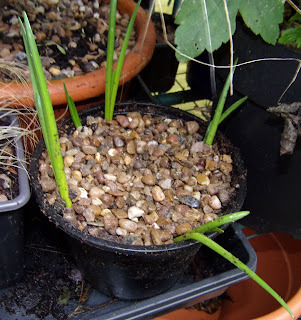 Still, giving myself a talking to, I replanted them on a very cold morning last weekend. ...and the bigger ones, decently covered up. I now have to wait and see what they are. Note to self: keep an eye on pots of bulbs and try to remember to label them! Thanks, Sally. It will be fun to find out what these bulbs are. I'm usually pretty good at labelling or keeping notes of what things are - obviously these slipped through the net! Nice surprise to see what they are when in bloom :-). I have some bulbs lying around in the garden too... I think they were dug up by a cat, might be Pippi. Thanks, Mirjam. I look forward to finding out what they are. Scruffy seems to leave the plants in our garden alone...except for some catmint which I bought and had to give away because he squashed it by rolling on it and then ate most of it! Thanks and welcome, Cherie. 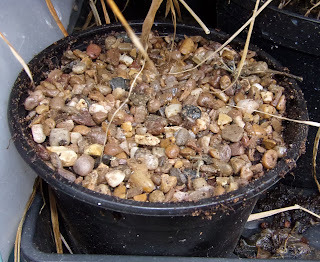 I'll write another post about the bulbs once they have shown me what they are. Ooh, carbon copy of you, eh? Sounds intriguing... I shall have to visit your blog! I've been known to buy bulbs and find them sprouted in their packets come spring, poor things. I haven't bought many this year but I did manage to get them in soil. 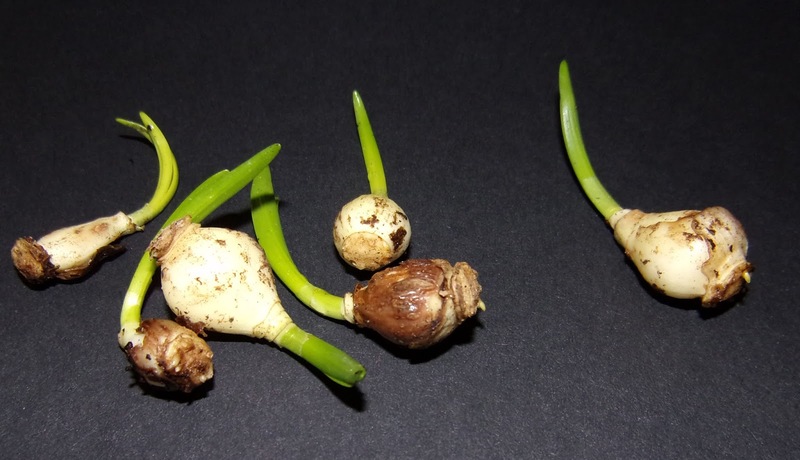 It will be a nice surprise when your bulbs flower, you'll know what they are then.